A common feature in process tanks is an air agitation system. Commonly these air spargers consist of a series of small diameter pipes with air forced through them. Typically, the piping needs to be secured in place. This is a very easy thing to do with a drop in tank liner. With the tank liner properly installed, the air sparger system can be put into place over top of the liner. Cut small straps from the scrap PVC material supplied with your tank liner. Place the straps over top of the pipes. 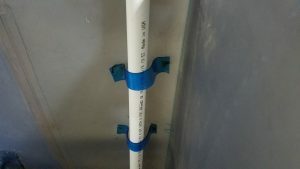 Using either a hot air welder or flexible PVC adhesive (see videos here and here), weld the ends of the straps to the tank liner. The straps are a fast, easy, and effective solution for holding the piping, or any other equipment, in place.